Marcus Boon is a writer, journalist and Professor of English at York University, Toronto. I recently interviewed Winnipeg based writer/artist/architect Rob Kovitz about his epic 8 volume 4500 page novel Ice Fishing in Gimli, for a chapbook published in conjunction with the exhibition of the book currently on show at The Department in Toronto, and curated by Michael Maranda of the Art Gallery of York University. The book is almost entirely appropriated from other people’s writings (some of the photos are by Kovitz) and Kovitz says that, amongst other things, he was inspired by Walter Benjamin’s similarly vast Arcades Project, which also consists largely of quotes taken from other people’s writings. 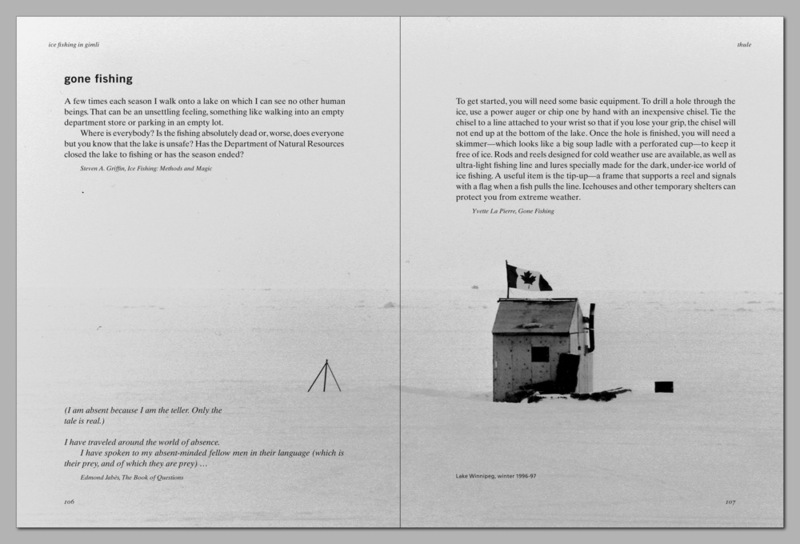 Kovitz’s book is a heroic Melvillean exercise, ice fishing instead of whale fishing, digital text archives instead of pen on paper, a similar sense of extensive intimacy with territories way off most people’s maps (although Guy Maddin and others have also made works focusing on Gimli, a town 75 km north of Winnipeg, originally populated by people of Icelandic descent). I like the sense of Ice Fishing as an impossible book, far too long to actually read, but what’s strange is that Ice Fishing is a very compelling read, with a powerful narrative drive. This produces a strong sense of pathos: the book seems to anticipate its own rejection or being ignored, even in the act of you exploring it. I’ve been meaning to write an essay about the history of copying in Canada for a while, and Rob and I touched on this in conversation: Glenn Gould’s spliced sound recordings; John Oswald’s Plunderphonics; Christian Bök’s dictionary channelling Eunoia; Guy Maddin’s pastiche films; Gail Scott’s appropriated texts like My Paris and The Obituary; Nourbese Philip’s cut up slave narrative, Zong! Not to mention visual artists such as Michael Snow (the Walking Woman pieces for sure, but also the movie Wavelength which over forty five minutes focuses in on a photo of a lake or sea) or Shary Boyle’s perverse porcelains. And McLuhan. And … there’s a lot of appropriation going on up here! One might ask: why? Filed Under: Essays Tagged With: Art Gallery of York University, Canada, Christian Bök, Copying Culture, Eunoia, Gail Scott, Glenn Gould, Guy Maddin, Ice Fishing in Gimli, John Oswald, M. Nourbese Philip, Marshall McLuhan, Michael Maranda, Michael Snow, My Paris, Plunderphonics, Rob Kovitz, Shary Boyle, The Department, Walter Benjamin, Wavelength, Winnipeg, Zong!